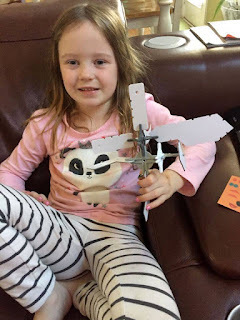 New aircraft and off-road vehicle created in Shreveport! 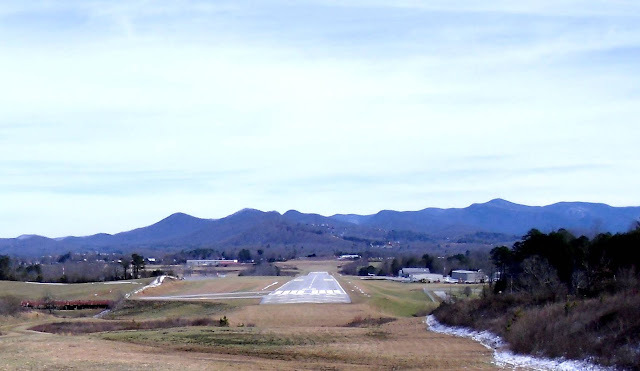 Flying Magazine says a startup company with the goal of meeting off-road accessibility with the freedom of flight just got the go-ahead from the FAA. “SkyRunner announced this week that its flying all-terrain vehicle has earned S-LSA approval, paving the way for the company to ramp up production at its Shreveport, Louisiana, manufacturing plant. 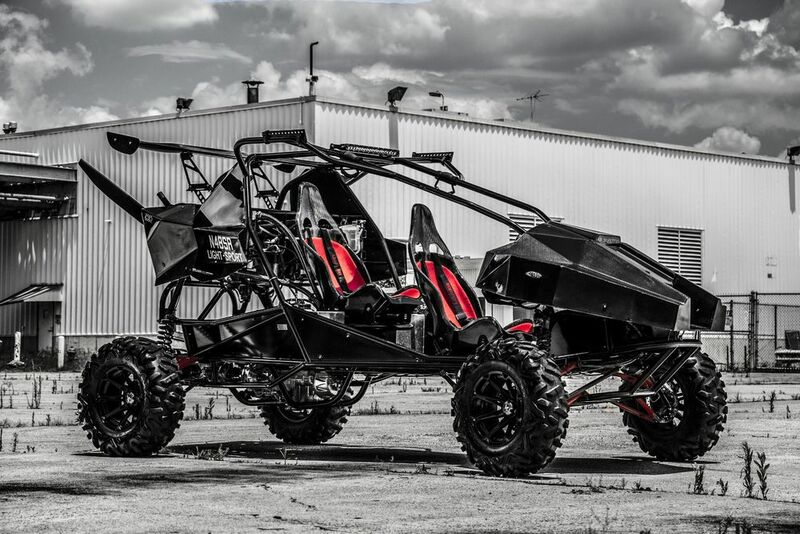 “Marketed with the go-anywhere adventurer in mind, the SkyRunner is a four-wheel ATV that uses ram-air parafoil wing technology, or powered-parachute flight, and a three-blade propeller to take to the sky on takeoffs that require about the length of a football field. 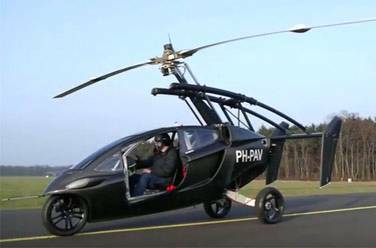 “SkyRunner, which has just two flight controls — left and right steering and a throttle pedal — says its vehicle can reach airspeeds of 45 mph and cruise at the maximum regulated altitude of 10,000 feet. "Mr. Dyer invented and flew the machine on his farm in Choestoe Community many years before the Wright brothers’ flight at Kitty Hawk, NC. 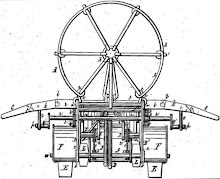 Union County and the surrounding counties did not have newspapers at that time, but the story of Mr. Dyer’s invention was reported in dozens of newspapers across the U.S., perhaps also in foreign countries since efforts were being made all over the world at the time to build a machine that could fly. Several neighbors witnessed Mr. Dyer’s flights, and knowledge of his invention was spread by word of mouth throughout the county and beyond. "For the entire month of Septem- ber, the Blairsville Chamber of Commerce has an exhibit in their lobby showcasing Mr. Dyer’s invention. 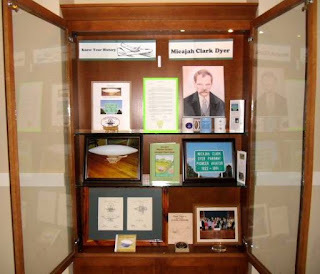 "Chamber member Micajah Clark Dyer Foundation welcomes everyone to come by and see the exhibit and pick up a brochure that has a brief story about Mr. Dyer. It includes the credit he has received to date, plans for future efforts to acquaint the public about this wonderful piece of Union County history, and efforts that will continue into the future to keep the legacy of our pioneer aviator alive. "You can also learn about the story at www.micajahclarkdyer.org." It is always exciting to find newspapers from the 1800s that published articles about Micajah Clark Dyer's flying machine. 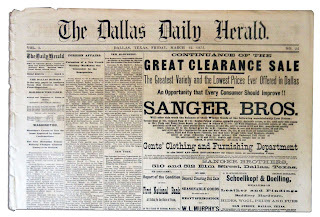 In our post below dated August 3, 2012, we told about the five 1875 articles newly found by Jim Powell, which brought to 18 the number of different newspapers we had found up to that time. 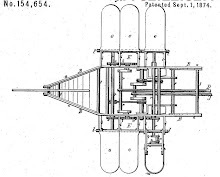 "Mr. Micajah Dyer of Union County, Blairsville, Ga., recently obtained a patent for an apparatus for navigating the air..."
There were no newspapers in Union County or its adjoining counties in 1874 when Clark Dyer was granted a patent for his flying machine, but it obviously was big news across the United States. It is very likely that there were more newspapers than the 23 we have located that reported the story. In fact, we speculate that the story was reported in Europe and Australia, as well, because attempts were being made all over the world at that time to design a machine that would fly. We share a very special story by way of a video, Born to Fly, about a 92-year-old female WWII Pilot who flies her plane again, after 70 years! We're so proud of Spitfire pilot Joy Lofthouse. She is a kindred spirit of Micajah Clark Dyer. The wings on the model are left uncovered to show how Clark's design allowed him to move the wings to navigate the airplane. The wings could be tilted upward and downward in four directions. The to-scale model of Clark Dyer's airplane is on display in the Union County Historical Society Museum in the Old Courthouse on the Square. 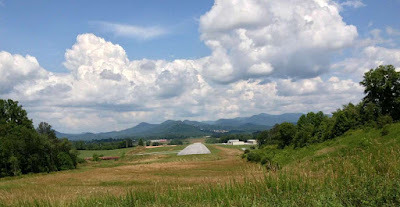 You can scroll down and click on "Older Posts" to learn about the building of the model by Jack Allen of Blairsville, GA.
Don’t forget . . . you can always support the Micajah Clark Dyer Foundation by logging into AmazonSmile.com when you make purchases online from Amazon. • Then sign in using your regular Amazon account. • Choose a nonprofit from the list on spotlight. Make sure you choose Micajah Clark Dyer Foundation, Inc.
Then you’re good to go. This is a wonderful and easy way to donate to the Foundation at no cost to you while doing your own shopping.